The Parkers Prairie Sportsman’s Club has been a community organization in Parkers Prairie and Miltona since 1952. The main purpose of the Sportsman’s club is to promote and maintain area fish and wildlife with strong consideration of conservation. The Sportsman’s club has sponsored and funded many projects since its inception in 1952. In the 1960’s the club blocked the runoffs into Lake Adley to clean up the lake and built a damn on the South end of Fish Lake to keep the water level high enough for fish to survive the harsh winters. More recently the club has donated a boat landing and dock at Lake Adley Park. They have also donated public docks on Lake Vermont and Fish Lake. They also developed and maintain a public rifle range Southwest of town. 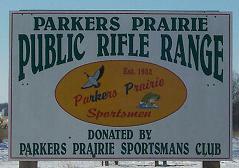 Visit the Parkers Prairie Sportsmen’s Club, Inc. website. The Sportsman’s club has purchased and maintains aerators for Lake Adley and Fish Lake. The aerators have been in the lakes since the early 1980’s and work to maintain open water to provide ample oxygen for the fish to survive. The club is funded in part by an annual fund raiser and proceeds from the sale of pull tabs in local establishments. Half of the money they raise is donated to Charity and they also support the Deer Hunters Association, Ducks Unlimited, Wild Turkey Federation and other wildlife programs. When the City built the Prairie Event Center the Sportsman’s were the second highest local club to contribute totaling $50,475.00 of their own assets as well as hold their annual fund raiser at the center.